With the news that the City of Stratford was successful in fending off a challenge to Official Plan Amendment 10 (OPA 10) from Avonwood (Smart Centres), there is a collective sigh from the community. Some are happy at the news that Avonwood, and its proposed Wal-Mart development, have been banished from the community; on the other side, there are those that are angry they will have to continue to drive to Kitchener or London to load up on cheap household items. However, the reality is, the result of the Ontario Municipal Board's (OMB) decision will probably result in something a bit more in the middle - a Wal-Mart in the city's west-end (as opposed to the east where it wanted to locate). However, it's what's in the OMB decision that is of most interest, as not only was Avonwood told it couldn't locate its development wherever it wished, but more importantly market-based planning was given the boot and the community's uniqueness was enshrined. The first element of the decision that was of most interest was how the OMB highlighted the importance of downtown and the success of the Festival Theatre. 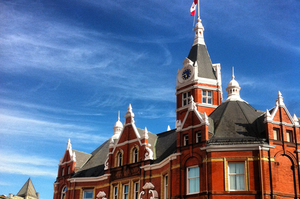 The connection between having a successful theatre that resulted in the downtown's heritage being preserved, and the fact that tourists are attracted to Stratford not just for theatre but for the ambiance of the downtown, highlighted how the two are inter-connected - without an unique and successful downtown, Stratford would be just another place to see theatre. And, if Stratford was just another place to see theatre, it wouldn't be successful. This is something that people in Stratford have recognized for years and now it has been recognized in law - and was connected to the Provincial Planning Policy Statement (the constitution of urban planning for those that are interested). The other important aspect of the decision was to protect the city's industrially zoned properties. While the re-zoning of one parcel of industrial land doesn't seem like much, it removes land-use certainty so that developers begin bidding up the cost of industrial land so much so that they price out industry. The result is manufacturing (and higher paying jobs) get pushed out in favour of commercial developments that can afford higher land-use costs. This is something the city cannot afford over the long-term and will help retain industry in the east-end. The most important part of the decision though was that the OMB preserved democratic and policy led planning, over market dictated development. Avonwood proposed that the city adopt a process for approving new commercial zoning based on what the market wanted, as opposed to policy-based planning that takes a long-term view to ensure the responsible growth of the community. At the heart of the debate in Stratford was two philosophies of planning - one based on community consensus and another based on commercial interests. In the end, consensus and democracy won. For that, the citizens of Stratford and their council deserve a round of applause. In the end though, there will be a Wal-Mart in Stratford - but it will on the terms and conditions that Stratfordite's have put in place. And, as a person who was a city councillor who was there when the battle began - one that was as anti-Wal-Mart as you could get - I do have to say that the Wal-Mart of today is not the Wal-Mart of yesterday. The Wal-Mart of today is a corporate leader in sustainability - driving it deep into their supply chain and bringing their competitors along for the journey. I will welcome them in Stratford - as long as they are downtown or in the west-end, just like OPA 10 has dictated.